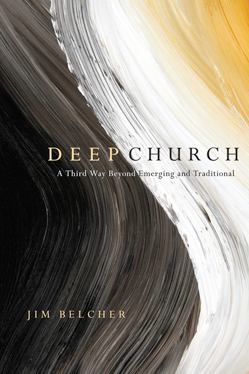 On our way back from Chicago this Christmas Esther and I stopped in Grand Rapids, where I picked up Jim Belcher’s Deep Church: A Third Way Beyond Emerging and Traditional (IVP 09), which we read aloud to each other on the ride home (to keep the driver from getting too bored!). Its a fascinating read – highly narrative, interactive with all sorts of leading emergent and evangelical thinkers, thoughtful, generous, humorous. I really enjoyed it and learned a lot, and I think we need more books which both try to learn from and critically analyze the emerging church. Here I’m going to focus on my own critiques of Belcher’s approach, but I could also say a lot more about all that I appreciated about this book. One of the most interesting parts of the book for me was chapter 3, where Jim makes an appeal for unity between emergents and traditional Christians on the basis of the “Great Tradition,” i.e., the broad, classical consensus of orthodox essentials hammered out in the Apostles Creed, the Nicene Creed, and the Athanasian Creed. I’m with Jim in the desire for unity, the distinction between between first-tier and second-tier doctrine, and the call for charity in disagreement. But I think an appeal to unity would be more stable if it went beyond the first five centuries of church history and also considered, say, the sixteenth. If “the Holy Spirit has a history” (p. 59), shouldn’t we learn from the all of his history? The early creeds are historically conditioned documents, dealing with specific doctrinal threats in the early church (such as Arianism). They are helpful, but they don’t settle every question that can divide Christians. I think an appeal for unity between emergents and evangelicals, especially given the complexity of their disagreements, needs a broader base. In addition, in distinguishing between first and second-tier doctrine, I think we need we need to be careful not to downplay the importance of second-tier differences – Calvin, for example, did not call the second-tier “things indifferent,” as Belcher claims on p. 62! Something can be non-essential and still important. In my opinion, we must recognize that second-tier doctrines exist in a spectrum of importance. My main dissatisfaction with the book is that the whole presentation in terms of a “third way” between the emergents and traditionals felt a bit caricatured. For starters, the term “traditional church” is so elastic that it can include basically anybody who is (1) evangelical and (2) not emergent. Conceiving of such a massive and diverse group as a unit stretches the usefulness of abstract nouns. Virtually any sentence that begins, “the traditional church is like …” is difficult to complete with accuracy. Moreover, in my opinion, many of the differences between emergents and traditionals (if we must use these categories) don’t call for discerning appropriation between the two into a “third way,” but approval of one and rejection of the other. I’m grateful that Jim basically takes this approach in critiquing McLaren on the gospel in chapter 6 and Pagitt on preaching in chapter 8.